Your home’s plumbing may include a ‘grinder pump system. 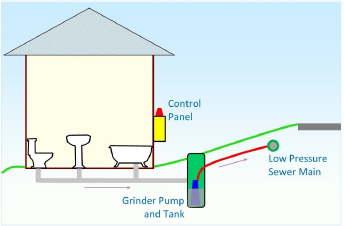 Grinder pump are used in neighborhoods where site conditions such as building elevations and ground slopes make construction of conventional ‘gravity sewers’ impractical. Grinder pumps made development of your neighborhood and home possible. Your grinder pump system safety and efficiently pumps wastewater (also known as ‘sewage’) created inside your home into the wastewater collection and treatment system serving your property. What can I do to keep my grinder pump running trouble-free? A little bit of occasional care will go a long way toward keeping your grinder pump running problem-free. Once or twice a year, remove the tank’s lid. Hose off any debris or grease that has accumulated on the flat or on the inside wall of the tank. Have the pump “cycle” by filling the tank with water from a garden hose and allowing the pump to run until it shuts off automatically. Run a faucet in the house for 10 to 15 minutes – long enough to cause the pump to start. Stand near the tank and listen for sound that the pump has started. Once the pump has begun running, turn off the faucet. The pump will run until it has emptied the tank and will shut off automatically. Do not turn off power to the station while away from home. What can my grinder pump do? Your home’s grinder pump can safely send normal household sewage from your home to the wastewater treatment system. This includes kitchen, bath, laundry, and toilet waste. What can my grinder pump NOT do? If your home has a power outage, minimize your water usage. Your grinder pump and control panel will not work without electrical power. The tank is large enough to store some water until electrical power is restored. Once power is restored, the panel alarm may sound for a short time until the grinder pump has pumped the tank back to a normal level. What if my grinder pump stops working? Your pump’s control panel has both an audible alarm (horn) and a visible alarm (red light). The control panel is mounted to an exterior wall near the tank. If you see or hear a pump alarm, call our Service Department immediately at 800-844-8350. Alarms will activate if the water in your tank rises past a set level, or if your pump is not working properly. You can temporarily mute the alarm horn by pressing the “Silence” button on the side of the control panel. The alarm light will remain on until the pump returns to normal operation. If you do not see or hear an alarm, but see water seeping out of the tank, hear that the pump is running for 15 minutes or longer, or hear any unusual sounds from the pump such as rattling or spraying, call the toll free number shown above and let us check it out. What is the Grinder Pump Repair Plan? The Grinder Pump Repair Plan (Plan) provides protections and peace of mind for participating owners of residential grinder pump systems. For a small monthly fee – sometimes incorporated into your HOA fees – you are protected against the potentially high cost of repairing or replacing your grinder pump, should the pump fail. The Plan covers repair or replacement of your pump, piping and valves, and control panel. The monthly fee is all you pay – there are no deductibles or co-payments. Plan participants may call a toll-free hotline 24 hours a day, 365 days a year, to report a problem with their grinder pump. SWWC will quickly have a service technician contact the homeowner to assess the case. Sometimes the problem can be resolved easily by the homeowner. But if not, SWWC technicians are ready to make the repair on-site. There are certain exceptions to the Plan. Cases of willful misuse or abuse of the grinder pump system are not covered; refer to the “What can my grinder pump NOT do?” In these cases, the customer will be responsible for the cost of pump repair or replacement. Catastrophic events such as fire or natural disaster are also excluded from the Plan. These cases should be covered by the homeowner’s insurance policy.